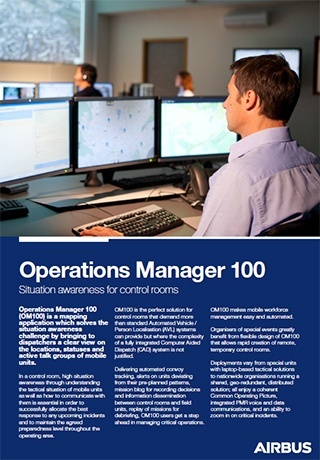 Thanks to the OM 100, the dispatcher sees where each unit is. He also sees which unit can accept a new task. When there is an incident, he knows exactly which unit is closest and can be sent to the task. The dispatcher can define how often mobile units update their location. The update can be based on the time passed, or on the distance travelled. The OM 100 gives more than standard Automated Vehicle / Person Localisation (AVL/APL) systems. It is the ideal choice when a complex, fully integrated Computer Aided Dispatching (CAD) system is not needed. The OM 100 helps track the units. It lets you set up automatic tracking of units. The dispatcher will get an alert if a mobile unit strays from a pre-planned route or from the duty area. The OM 100 makes it easy for the dispatcher to send a messages to the units in the field, or to other dispatchers. Message groups also work as a mission blogs. The blog records the actions. Key decisions can be shared during an incident, and they can be reviewed later. Radio Console System 9500 (RCS 9500) is the most modern TETRA dispatching console in the market. Control room dispatchers can use it to easily and quickly access the TETRA communication features. You can build a user interface for your RCS 9500 so that it suits the way your organization works. Are you looking for a very small TETRA radio? But with very advanced features and big performance? The TH1n slimline TETRA radio is small and light-weight. Even so, it has all the features and functions you need. A TETRA radio communication system from Airbus is the safe, professional choice. No other technology today can better meet the users' needs today - or even in the near future. These systems will continue to give valuable service for another 20-30 years. The Mobile Data Gateway (MDG) provides automatic vehicle location (AVL) services to access the location information of mobile units. 3rd party data applications can use the MDG for risk-free integration to TETRA and Tetrapol network technologies.